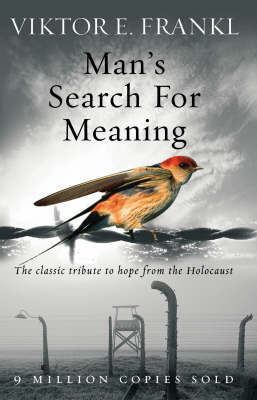 Man's Search for Meaning is a 1946 book by Viktor Frankl chronicling his experiences as a prisoner in Nazi concentration camps during World War II, and describing his psychotherapeutic method, which involved identifying a purpose in life to feel positively about, and then immersively imagining that outcome. According to Frankl, the way a prisoner imagined the future affected his longevity. The book intends to answer the question "How was everyday life in a concentration camp reflected in the mind of the average prisoner?" Part One constitutes Frankl's analysis of his experiences in the concentration camps, while Part Two introduces his ideas of meaning and his theory called logotherapy. According to a survey conducted by the Book-of-the-Month Club and the Library of Congress, Man's Search for Meaning belongs to a list of "the ten most influential books in the United States." At the time of the author's death in 1997, the book had sold over 10 million copies and had been translated into 24 languages. The book and Frankl himself would however garner considerable controversy by many, most notably amongst Holocaust analyst, Lawrence L. Langer who upon reviewing the book, was perturbed by both Frankl's promotion of his logotherapy ideology, the survival of the fittest subtext, the tone of self-aggrandizement and general inhumane sense of studying-detachment with which Frankl appears to have treated the victims of the holocaust, as all deeply problematic. 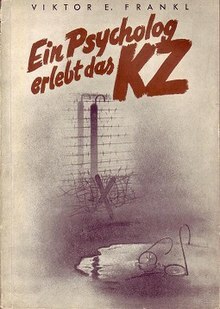 The book's original title in German is ...trotzdem Ja zum Leben sagen: Ein Psychologe erlebt das Konzentrationslager: that is, "...Nevertheless Say 'Yes' to Life: A Psychologist Experiences the Concentration Camp". The title of the first English-language translation was From Death-Camp to Existentialism. The book's common full English title is Man's Search for Meaning: An Introduction to Logotherapy, although this subtitle is often not printed on the cover of modern editions. Frankl identifies three psychological reactions experienced by all inmates to one degree or another: (1) shock during the initial admission phase to the camp, (2) apathy after becoming accustomed to camp existence, in which the inmate values only that which helps himself and his friends survive, and (3) reactions of depersonalization, moral deformity, bitterness, and disillusionment if he survives and is liberated. Frankl concludes that the meaning of life is found in every moment of living; life never ceases to have meaning, even in suffering and death. In a group therapy session during a mass fast inflicted on the camp's inmates trying to protect an anonymous fellow inmate from fatal retribution by authorities, Frankl offered the thought that for everyone in a dire condition there is someone looking down, a friend, family member, or even God, who would expect not to be disappointed. Frankl concludes from his experience that a prisoner's psychological reactions are not solely the result of the conditions of his life, but also from the freedom of choice he always has even in severe suffering. The inner hold a prisoner has on his spiritual self relies on having a hope in the future, and that once a prisoner loses that hope, he is doomed. Frankl also concludes that there are only two races of men, decent men and indecent. No society is free of either of them, and thus there were "decent" Nazi guards and "indecent" prisoners, most notably the kapo who would torture and abuse their fellow prisoners for personal gain. His concluding passage in Part One describes the psychological reaction of the inmates to their liberation, which he separates into three stages. The first is depersonalization—a period of readjustment, in which a prisoner gradually returns to the world. Initially, the liberated prisoners are so numb that they are unable to understand what freedom means, or to emotionally respond to it. Part of them believes that it is an illusion or a dream that will be taken away from them. In their first foray outside their former prison, the prisoners realized that they could not comprehend pleasure. Flowers and the reality of the freedom they had dreamed about for years were all surreal, unable to be grasped in their depersonalization. The body is the first element to break out of this stage, responding by big appetites of eating and wanting more sleeping. Only after the partial replenishing of the body is the mind finally able to respond, as "feeling suddenly broke through the strange fetters which had restrained it" (111[clarification needed]). Upon returning home, the prisoners had to struggle with two fundamental experiences which could also damage their mental health: bitterness and disillusionment. The last stage is bitterness at the lack of responsiveness of the world outside—a "superficiality and lack of feeling...so disgusting that one finally felt like creeping into a hole and neither hearing nor seeing human beings any more" (113). Worse was disillusionment, which was the discovery that suffering does not end, that the longed-for happiness will not come. This was the experience of those who—like Frankl—returned home to discover that no one awaited them. The hope that had sustained them throughout their time in the concentration camp was now gone. Frankl cites this experience as the most difficult to overcome. As time passed, however, the prisoner's experience in a concentration camp finally became nothing but a remembered nightmare. What is more, he comes to believe that he has nothing left to fear any more, "except his God" (115). One of Frankl's main claims in the book is that a positive attitude was essential to surviving the camps. Consequently, he implied that those who died had given up. However, historians have concluded that there was little connection between attitude and survival. The popularity of Frankl's book, as well as misunderstandings of Frankl's disclaimers,[which?] contributed to the myth that Holocaust victims were partially responsible for their fate. Holocaust analyst Lawrence L. Langer finds Frankl's promotion of his logotherapy ideology, the problematic subtext, the tone of self-aggrandizement and general inhumane sense of studying-detachment with which Frankl appears to have treated the victims of the holocaust, as all deeply problematic. ^ Fein, Esther (1991). "Book Notes". New York Times. Retrieved 22 May 2012. ^ Noble, Holcomb B. (September 4, 1997). "Dr. Viktor E. Frankl of Vienna, Psychiatrist of the Search for Meaning, Dies at 92". The New York Times. p. B-7. Retrieved 22 May 2012. ^ "Viktor Frankl Life and Work". Viktor Frankl Institute Vienna. 2011. Retrieved 22 May 2012. ^ Szasz, T.S. (2003). The secular cure of souls: "Analysis" or dialogue? Existential Analysis, 14: 203-212 (July). ^ Frankl, Viktor (1959). Man's Search for Meaning. ISBN 9780807014295. ^ Middleton-Kaplan, Richard (2014). "The Myth of Jewish Passivity". In Henry, Patrick (ed.). Jewish Resistance Against the Nazis. Washington, D.C.: Catholic University of America Press. pp. 9–10. ISBN 9780813225890. Gilmore, Byron Ross (1997). The search for meaning in grief: A comparison of Victor Frankl's 'Search for Meaning' with Douglas Hall's 'Theology of the Cross', and their implications for grief ministry (M.A. thesis). Wilfrid Laurier University. This page was last edited on 18 March 2019, at 17:29 (UTC).